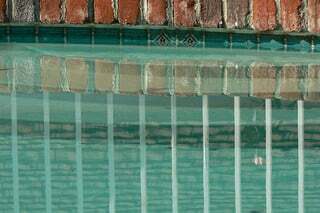 I am often asked whether waterline or other tile on your fiberglass pool is a good decision. The colors and styles are beautiful! Here are some things to think about. There are 2 types of tile we do on fiberglass pools. A 6" strip of waterline tile or a variety of inlaid tiles that are manufactured right into the shell itself. Check this section out from Viking to see what I mean. To decide if waterline tile is something essential to the look of your pool, consider the big picture: how does the deck design, water features, coping and landscaping influence the overall aesthetic? Do you want to spend your money elsewhere or is the charm the tile provides the missing element? If you are using stamped concrete and a jazzy pool shell color, maybe you have enough color stuff going on without tile! Your pool contractor can really help break down design elements like this and guide you to various ways to achieve the look you want. As to the inlaid tiles, there are thousands of fish, mermaids, turtles etc. but the most popular seem to be strips of tile that highlight steps and benches. The manufacturer actually creates an indentation for the tile in the shell when it is manufactured and the tile is laid into the indentation. Inlaid tile is a custom feature done by the manufacturer. I like them but they are expensive! It’s not just about looks because, over time, a line appears at the water level because of the difference between the sun and the stuff in the water including sunscreen, pool chemicals, body oils, dirt. Kind of like ring around the collar. It’s not noticeable if you add water regularly and maintain the level. But adding tile above the water line is a nice way to trick the eye so that you will never see this difference in color. Waterline tile isn’t necessary on fiberglass, but it adds visual interest. It can also be used to create a more level pool when installed after installation. A nice tile job can completely cure the look of a pool that is not too much out of level. Ceramic or glass pool tile are used on fiberglass pools; it’s the adhesive that really matters. Silicone is used, because it flexes with the movement of the pool and it’s easy to clean. Application involves applying a silicone adhesive to the tile, positioning it on the fiberglass, securing until it sets, applying mildew-resistant grout in between the tile and doing touch up where necessary. It is, when you have done this type of application on fiberglass pools a few times before. Not all builders have this experience so make sure you verify his degree of skill if you plan to install waterline tile. Waterline tile can last more than 10 years with proper installation and water balance. The pool doesn’t need to be fully drained to do repairs, unlike inlayed tiles, which are often installed below the water line to denote stairs, benches. Your pool shape may dictate the best tile size and shape: it is usually best to choose tiles around 2” wide. Waterline tile generally costs up to $2500-$3000 or so. What other pool options are part of the decision making process? Get our free checklist and make sure you Choose the Right Pool, Options and Builder.